Every club has seen it advertised on Mind Sports South Africa's calendar of events for the last 18 months. Which esports titles will be played in 2018. The agenda for such meeting runs to 24 pages. A lot has happened in the past 12 months, and MSSA has had to deal with a dying economy. Yet MSSA still managed to send its official esports team overseas, and the BOO! Protea Esports Team did well. So well that it climbed back up to 12th place in the official ranking of member countries. However, enough of that, now is the time for member clubs to stand up and be heard. For those clubs that cannot make it to the National Convention, the official Proxy Form is on the Google Drive. To make it fair to all member clubs, motions cannot be amended. All other clubs - 1 vote for every five paid-up registered players. 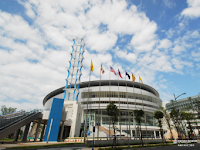 IESF announces the venue for its 10th World Championships. The host city bid results for the 10th Esports World Championship 2018 was taken by Kaohsiung city (Chinese Taipei) which was lead by the Chinese Taipei Esports Association (CTeSA). The results were announced at the closing ceremony of the 9th Esports World Championships - Busan. 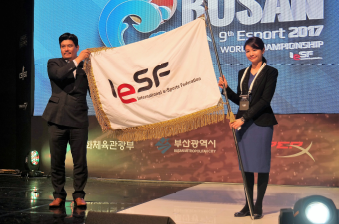 The 10th edition of IESF's Esports World Championship is expected to be the greatest Esports World Championship in size and scale in comparison to all former events. The venue in which the Esports World Championship will be held is none other than the Kaohsiung Arena. The Kaohsiung Arena has previously hosted many other sporting events. The stadium has the capacity of 15,000 seats, and has the history of holding the 2017 League of Legends Rift Rivals Seriesin 2017, as well as playing host to the World Games in 2009. Kaohsiung city government has promised that the Esports World Championship will be held to the highest standards and class. More detailed information concerning the 10th edition of the World Championships is to be announced by IESF from time-to-time. Mind Sports South Africa (MSSA), as usual, intends to send a team to compete at such event. 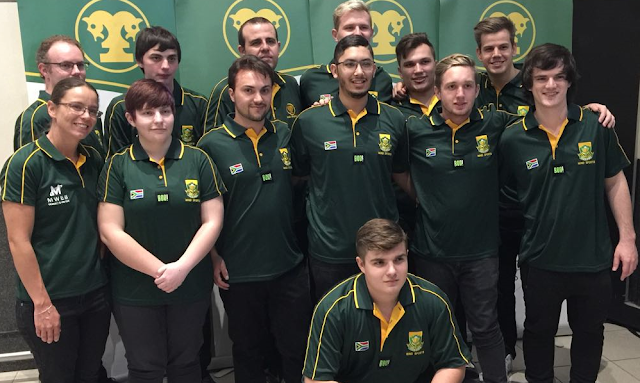 In fact, MSSA has sent a team every year to IESF's World Championships, and is the only country that has had members of both genders in its national team in every world championship since 2011. Kaohsiung City has recently been selected as one of the top 10 tourist cities to be visited in 2018 by Lonely Planet. Kaohsiung City too has the geographical advantages of both sea and airports, as well as perfect mass transit systems. Kaohsiung MRT connect High-speed Rail, Taiwan Railways and the international airport. While visiting the tournament, participants can tour Kaohsiung and enjoy the scenery and food of Kaohsiung. The host member CTeSA was founded in January 2012, and has since its formation been the national federation representing Chinese Taipei. 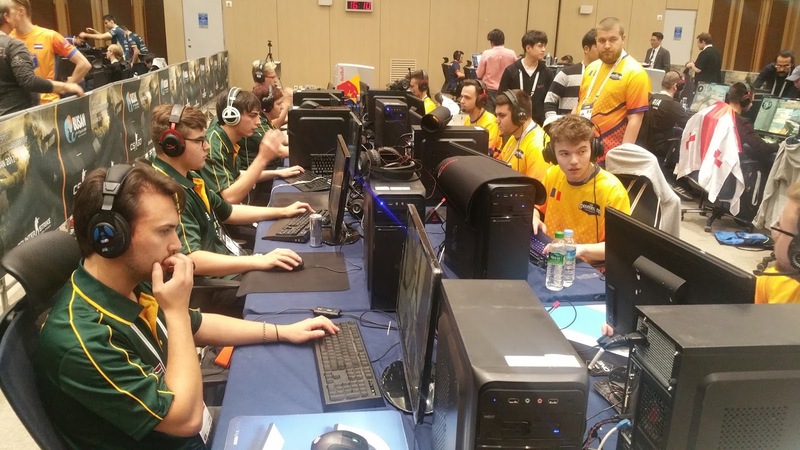 CTeSA are also proactive in the movement for esports recognition as an official sports, and have successfully received the recognition from the Ministry of Education and the Sports Administration. CTeSA is currently the one and only approved managing body for all esports event in Chinese Taipei just as MSSA is in South Africa. National Federation Colours up for grabs at MSSA's SA National Championships. 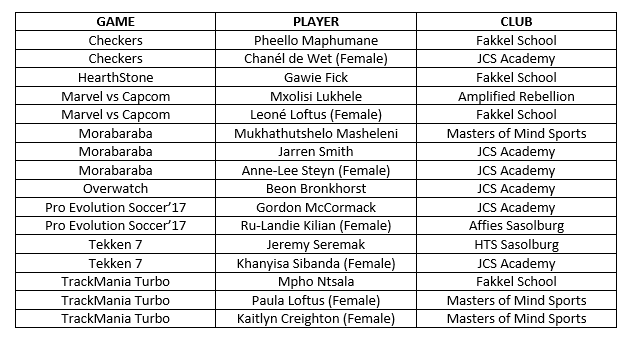 Players who have earned National Federation Colours. MSSA's South African National Championships (SAN) shall be hosted by Fakkel School, 20 Jan Smuts Ave., Sasolburg, on 2 & 3 December 2017. At such national championship, as usual, national federation colours may be earned by the participants. To earn such colours, the players must win each and every game that they play. Thus, a player by winning all his games will be awarded his/her national federation colours. However, it must be pointed out that national federation colours are not the same as Protea Colours. National Federation Colours are literally the step before earning Protea Colours. Protea Colours are only awarded in terms of strict criteria. All gamers are reminded that MSSA's South African National Championships are an open championship. In other words any registered player is entitled to enter the championship – no matter where they live, or their category of membership. Get your game on for SA Nationals. Accommodation offered by Fakkel School for MSSA's SA National Championships. The school has also kindly made its hostels available to participants at very reasonable rates. Please see the above photo. Bookings, including payment, must be done on Tuesday, 28 November 2017 at the latest. "SHOTCALLER" reported on 26 November 2017, that the German esports association called eSport-Bund Deutschland (ESBD) had just been formed. The association consists of 21 esports organizations including professional and amateur teams but also the industry association for interactive entertainment software as well as one of the world’s leading esports tournament organizers ESL. 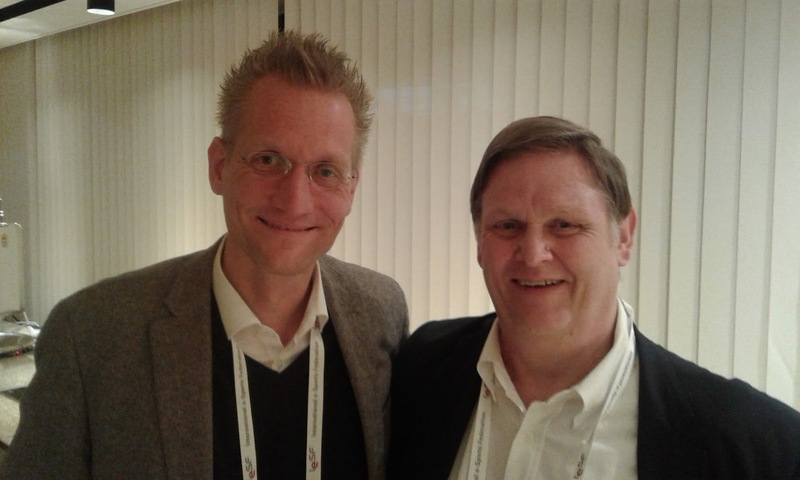 MSSA's Colin Webster had met with Jan Pommer (of ESL) at the Global Executive Esports Summit (GEES) in Busan just weeks before. The development of a German esports association is particularly exciting as it allows the German esports athletes to enter into the world of esports being an accredited sport. With Germany forming a proper esports association, yet another building block is put in place for esports to be considered as a sport by the IOC. Mind Sports South Africa, being the oldest association for esports in the world, has already sent its congratulations through to those concerned. 1st Brilliant Minds Gaming Championships - a huge success! 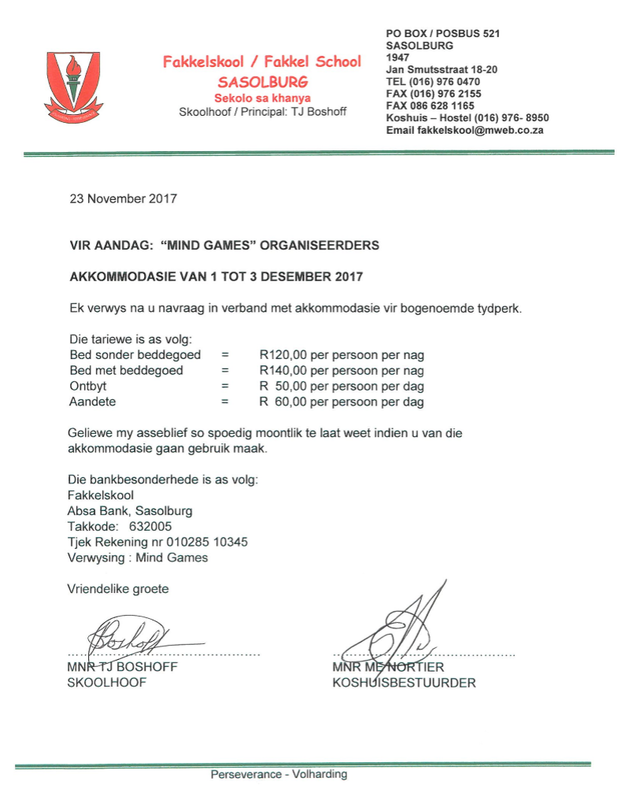 Masters of Mind Sports hosted the Metsimaholo Brilliant Minds Gaming Championships at Fakkel School in Sasolburg on 25 November 2017 - just a week before Fakkel School, in Sasolburg hosts MSSA's South African National Championships (SAN). The cold and rainy weather could not succeed in keeping the die-hard gamers away from the first Metsimaholo Brilliant Minds Gaming Championships. Once again, Fakkel School proved to be a gamers ‘hotspot’ for big events in the Northern Free State. Thank you very much to Mr Theo Boshoff, Mr Cobus van der Wath and Mr Henry Colin for ensuring a conducive gaming environment for all the players. A big thank you also goes to Mr Khathu Masheleni from Green Eden Nursery for playing a pivotal role in the successful outcome of the tournament. Three new esports titles were introduced to the event roster. Marvel vs Capcom, Overwatch and TrackMania Turbo caused a lot of excitement among the participants. New players from HTS Sasolburg showed their worth by completely dominating Tekken 7. Well done HTS Sasolburg! 32 players from 6 clubs battled it out to reign supreme. A good warm-up ahead of MSSA’s SA National Championships. Future leaders - members of MSSA's BOO! 2017 Protea Esports Team. There is no doubt that the saying 'leaders are born, not made" is absolute poppycock. The reason why some people just seem to be naturally born leaders is more to upbringing than anything else. If you look at the home-life of these so-called natural leaders, it is generally because there parents were leaders, and knowingly, sometimes unknowingly, passed the skills on to their children. Behavioral theories thus abound that people can become leaders through the process of teaching, learning and observation. Leadership is a set of skills that can be learned by training, perception, practice and experience over time. It is through many of the games played under the auspices of Mind Sports South Africa (MSSA) that players can teach themselves the skills of leadership that will stay with them for the rest of their lives. By putting a team together, resolving conflicts, dealing with the administration, and motivating the team in its darkest hours, players can hone their leadership skills. These are the very same skills that can be used in the work environment. However, what is a leader? In my mind, the answer is simple. The leader is the one who enables the others, is able to (through mere authority) encourage others to accomplish tasks, is able to put his/her own needs second to the team, and most of all lead by example by ensuring that the rules apply to him/her first. It is easy to see through those that garner leadership positions for their own gain. Such individuals come-and-go like ships in the night., and once gone are not missed. Thus, the opportunities offered within MSSA in administrative and gaming roles are there to help develop individuals, and should be taken advantage of by those willing to work and learn. Meridian Pinehurst is accepted into membership. The school aims to stimulate and motivate learners to receive and enjoy quality education, develop the necessary life skills and respect for diversity to guide them towards responsible adulthood, enabling them to take their rightful place in society. With Meridian Pinehurst affiliating to Mind Sports South Africa, there is no doubt that gaming in South Africa will continue to be developed and transformed. One can only commend such schools for their foresight and conviction. Thus MSSA is proud to welcome Meridian Pinehurst into membership. The addition of Meridian Pinehurst further increases the number of schools affiliated and will enhance all aspects of gaming in South Africa. The expansion of esports into primary schools sees the growing acceptance of esports as a sport among parents, educators and governing bodies. MSSA is confident that the school will have a long and fruitful association with MSSA and will further help to grow the various mind sports disciplines. It is through following rules that players may be selected to officially represent South Africa. It is well known that Mind Sports South Africa (MSSA) has a large body of rules with which it uses to govern not only its administration, but also the way in which it holds its championships and other events. There has been some criticism from some quarters in esports that MSSA is too 'rule bound'. However, it should be noted that it is through rules that society is created. Through creating good rules, good society is created in which all may feel safe and in which those that participate may row and prosper. Also,many of the rules that come into being are often due to individuals who have taken advantage of the system. No-one begrudges a person from manipulating the rule to favour him/herself, but when individuals flagrantly abuse the system, that is when a new rule comes into being in order to protect those within its community. Thus, since MSSA was founded in 1985, MSSA has seen its share of all types of gamer, aand, as a result has developed rules for all its events. However, that does not mean that the rules stop evolving. What may have stated as a simple rule,, may become more-and-more complex in order to take into account all possble outcomes. Thus, many of the newer organisations on the block seem to be battling with their own events due to the fact that their rules do not take into account the machinations of the few. It is not surprising then, that most private events are dogged by some sort of controversy as such organisations just do not have the history behind them of dealing with unique scenarios. However, in time, all events will be drawn closer through the need to regulate. Alasdair Donaldson (in Protea colours) demolishing his Namibian counterpart (in blue and red). It really doesn't matter whether you are deemed to be an amateur or a professional, it is the mind set of the person that defines him/her as a true competitor. Sure, professionals do have an advantage over amateurs in that they receive a salary and are able to do the sport as their first calling, whereas amateurs have to juggle with time to fit gaming into their work, family life, and other obligations. Robert 'PandaTank' Botha was a true professional. With his monthly sponsorship from CoolerMaster, Robert was able to dedicate his working day to gaming. For Robert it was a profession and he stuck to his strict routine of gym, practice, and analyzing the game. Yet every so often, an amateur pops up who shows that he is made of the stuff. Such is the likes of Alasdair Donaldson, who not only made it into MSSA's BOO! 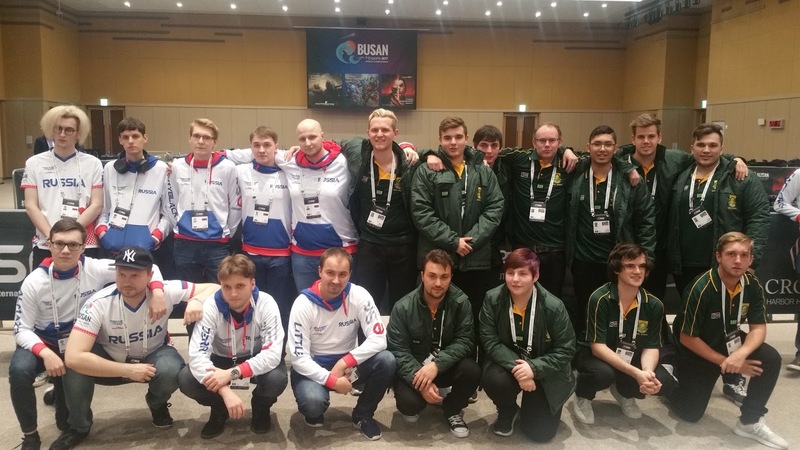 Protea Esports Team that wet off to play in IESF's 9th World Championships - Busan, got through the group stages, but is also committed to help train the next generation of SA's Tekken gamers. While at such IESF's 9th World Championships - Busan, Alasdair watched an learned. He too made a point of playing as many 'friendlies' as possible against the other competitors. Alasdair made it quite clear that he was there to perform - everything else was irrelevant. Participation at top international events are not seen as an end result, but instead are seen as just the beginning. Thus having participated in IESF's 9th World Championships - Busan, Alasdair seems to be even more enthused to play in championships in order to further improve upon his already awesome standard. For amateurs like Alasdair, participation in the sport seems to be a calling. Sacrifices are made for the sport, but there are also huge rewards. Hudson Park Primary School is accepted into membership. Hudson Park Primary is a co-educational school with a rich tradition, yet a future-focused and holistic approach to education incorporating the four main pillars of education. The pillars are the Academic, Physical, Cultural, and Pastoral pillars. It is always satisfying to have a school steeped in history and tradition embrace the new digital age in an effort to ensure that their learners are ready and prepared for what lies in store. Thus MSSA is proud to welcome Hudson Park Primary School into membership. The addition of Hudson Park Primary School further increases the number of schools affiliated and will enhance all aspects of gaming in South Africa. MSSA welcomes Lumiére Primary School into membership. Already this week, MSSA has processed two school club applications. At a time of the year when most organisations are thinking of year-end functions, the work keeps on rolling in for MSSA. 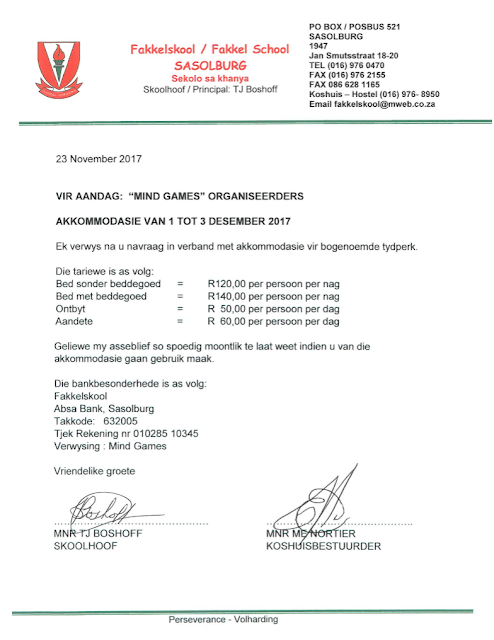 Mind Sports South Africa (MSSA) is without doubt the largest membership based organisation for gaming in South Africa and just continues to grow. MSSA is proud to welcome Lumiére Primary School into membership. The addition of Lumiére Primary School further increases the number of schools affiliated and will enhance all aspects of gaming in South Africa. 'Tis the season to ... transfer! It is only through being a member of an affiliated club, that a player may earn a spot in the National Protea Team. In order to transfer from one club to another, a Registered Player needs to settle all of his debts with his current club, and apply to such club to leave. MSSA, only allows this, unless in exceptional circumstances, to happen in the period 1 November to 28 February. In the past, gamers were known to 'clan hop'. While this at the time may have rewarded certain players with immediate gratification (in sponsorships, prize-money, etc.) it did nothing to allow a club to fully develop the gamer. If a club is not sure about the length of time that a gamer will be a member of the club, the club is more likely to abuse the gamer's skills and not further develop the gamer. So it has been in the past where MSSA has seen some gamers move from one club to another as soon as the club offered the gamer that little bit more. Teams that also stick together, learn how to deal with each other as a group, deal with problems, and work better as a team. In terms of MSSA's Constitution and Regulations, a Registered Player may only represent one club. The club that the Registered Player may represent is the first club that the Registered Player joined in the season. Such club is then known as the 'first claim' club and only such club may enter the person into championships or count his/her membership for voting rights. Thus, MSSA's records apropos membership do not show 'double-dipping' as a Registered Player may only be shown as a member of only one club and are quite accurate. The strength of any association remains its members. Since it is the clubs that are the members of MSSA, it is vital that MSSA protects and develops the clubs themselves. By regulating the movement of players, clubs are better able to budget and plan for how they want to develop themselves. Fakkel offers accommodation for MSSA's SA National Championships. 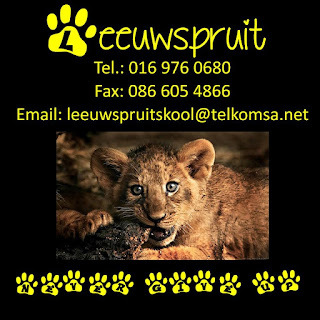 Leeuwspruit Primary School – Leeuwspruit Gamers Club accepted into membership. Mind Sports South Africa (MSSA) is without doubt the largest membership based organisation for gaming in South Africa. MSSA is proud to welcome Leeuwspruit Primary School – (Leeuwspruit Gamers Club) into membership. The addition of Leeuwspruit Primary School – (Leeuwspruit Gamers Club) further increases the number of schools affiliated and will enhance all aspects of gaming in South Africa. MSSA welcomes North Primary School (North School Gaming Club) into membership. MSSA is proud to welcome North Primary School (North School Gaming Club) into membership. The addition of North Primary School (North School Gaming Club) further increases the number of schools affiliated and will enhance all aspects of gaming in South Africa. Players who have represented South Africa in the Protea Team for three or more years. MSSA's 2017 BOO! Protea League of Legends Esports Team in action in Busan. At this time of the year while going through the administrative side of getting everything ready for the Annual General Meeting to be held on 3 December 2017, it is always interesting to look at the records. From the inception of Mind Sports South Africa (MSSA) in 1985, 243 players have been awarded Protea Colours for the various disciplines and periods falling under MSSA's jurisdiction. MSSA always seeks to have continuity in its Protea teams, but due to the very nature, that is not always possible. Things change, work gets in the way, and there are always a number of new gamers yapping on the heels of the older gamers. The competitiveness needed to get into the teams has ensured that South Africa has always punched well above its weight. As a result of such competitiveness, South Africa has produced no less than 22 world champions. All such champions have done South Africa proud, and MSSA is determined to create even more. However, only 18 players have ever represented South Africa for three or more years. Of such players, there is only one female who has so represented South Africa for three or more years. That gamer is Bernice Bőhm who also was a three times world champion. One can only hope that current and future gamers will aspire to reach such dizzy and lofty heights. Colours that may be earned at MSSA's SA National Championships. The final entry date for teams will be 20H00 on Sunday, 26 November 2017. The championship is an awesome opportunity for players to earn National and Provincial Colours (whichever is applicable) for their respective games and provinces. Such National and Provincial Colours are awarded in both Senior and High School categories. National Colours: All Players that win ALL of their Matches at a National Championship shall earn National Colours. Provincial Colours: All Players that have scored within the top 50% in a specific Period at a Provincial Championship, and who also score within the top 50% at a National Championship in the same period and in the same year, will earn Provincial Colours. Please note that there is a difference between National and Protea Colours. Effective coaching is the answer. Bin Muhammad Ridzuan Hazi Hasnul Hazi (2017 Tekken 7 World Champion) with SA's Alasdair Donaldson. Reviewing the performance of South Africa's BOO! Protea Esports Team at IeSF's 9th World Championships - Busan, it is clear that Mind Sports South Africa (MSSA) is doing many things right in terms of team selection and promoting general competitiveness. If MSSA were not doing things right, South Africa would not be currently ranked 12th in the world. However, like all other sports, it takes hard work to maintain a ranking, and even harder work to improve upon it. The answer to improve upon South Africa's current position is to improve the level of coaching in South Africa. 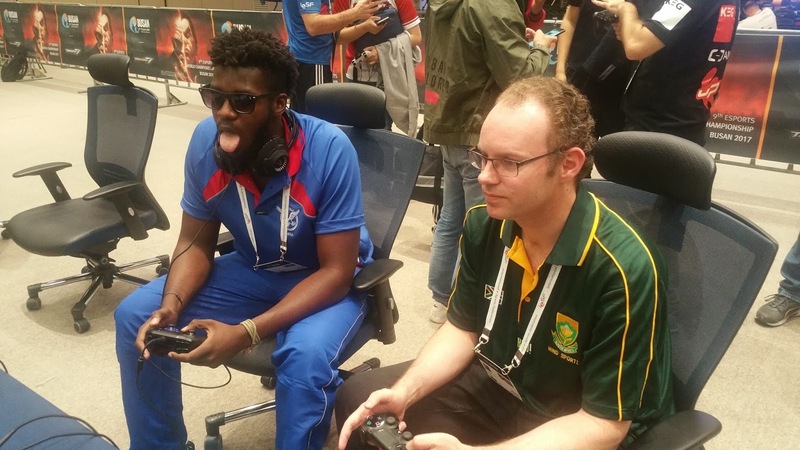 While still in Busan, Alasdair Donaldson, Brandon Fester, and Ryan van Schalkwyk all mentioned that the standard of coaching in South Africa could do with a lot of improvement.A lot of esports athletes train for long hours, whereas they such athletes may actually training too much. There may be more efficient ways to learn and develop. Coaches must be able to take into account mental aspects of esport like preparedness to train and fatigue, and how to manage both. It may be wise for coaches to apply the traditional sports model to esports as both a performance and business model. Effective coaching will lead to effective training which will have the knock-on effect will be that the competition level will increase, and if that happens, it would stand to reason that South Africa's performance on the international stage would also improve. Do in game scores matter as much as the final result? MSSA's BOO! 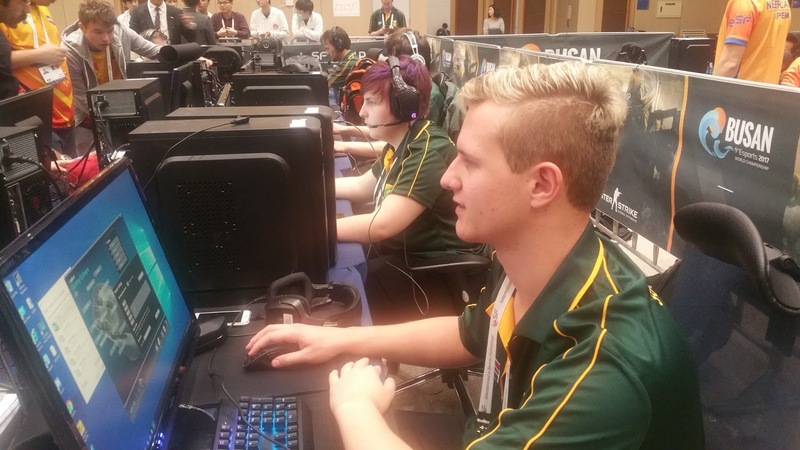 Protea CounterStrike: GO Esports Team taking on the juggernaut that is Romania. Many an esport athlete concentrates on the final in game score. For example, such esports athletes will console themselves with a 16 - 12 defeat (in the case of CounterStrike: GO). Such a defeat, many esports athletes will tell you, is proof of how close the game was, and that both teams had a chance of winning. However, I am of the opinion, that such comfort is indeed very cold indeed as a loss is a loss. That the losing team knows what the winning team was thinking. It is generally thought to be true by most coaches, people perform best when the game is close. When the winning team realises that the team against which they are playing is weaker, such winning team often becomes lax and overconfident. When a team is losing, it’s easy for such a team to become discouraged and give up. In such a case it is easy for a team to consider its opponents to be “in a different league” altogether. When a team does this, a team performs with less intensity than it would if the team perceived the “game” to be more equally matched. When esports athletes move away from viewing results based on the in-game score, the goals of the game will become clearer, and the athletes will be able to be more competitive. After all who remembers the in-game score, but what will be remembered is which team beat which. How to qualify for Protea Colours. Team Russia with the BOO! Protea Esports Team at IESF's 9th World Championships - Busan. With the end of the year fast aproaching, it is that time of the year again when many gamers look towards MSSA's 2018 National Team Trials, and wonder what they have to do to qualify for such Trials. The 2018 National Team Trials (NTT) for esports are already penciled in for 2 & 3 June 2018. Essentially, if the rules are broken, there may be a financial implication as well as a disciplinary implication. Depending on the severity of the breach, action may be taken by the International Federation concerned, or by the National Federation. 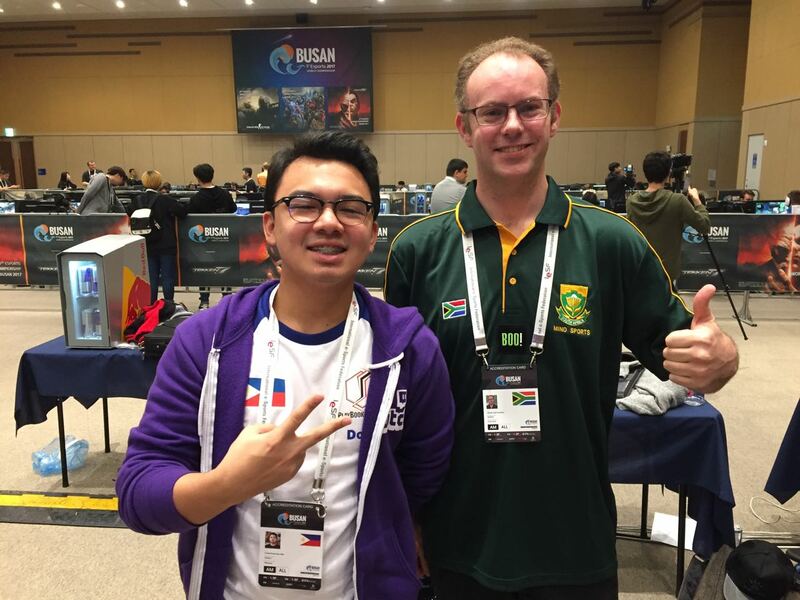 There is no difference between officially representing South Africa in eSports to any other sport. 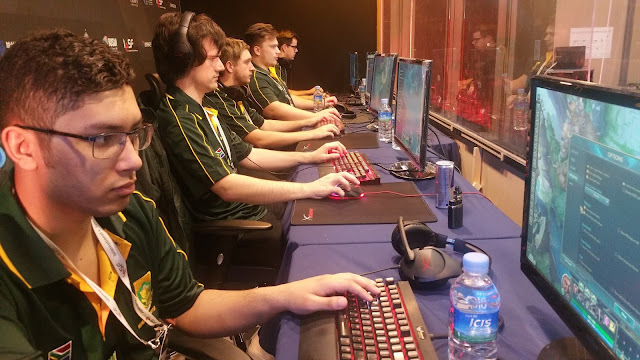 Esports is an officially accredited sport, and the Protea Colours that are awarded are the same Protea Colours as awarded to any other sport. Jason Batzofin shines at GEES. IeSF's 9th World Championships - Event schedule.